Starting with a flexible hassle-free installation, this Rapid SL installation system optimized for GROHE’s Sensia Arena shower toilets* was designed for maximum comfort in your bathroom. With the cutting edge GROHE Sensia WCs that perfectly combine the functions of a toilet and a bidet, you will discover a new level of comfort and hygiene. Thanks to GROHE QuickFix, the installation in front of a solid wall or inside a stud wall is swift, requiring no tools to connect hose and inspection shaft. Tested and certified to hold over 400kg, the powder-coated steel frame provides perfect stability and safety for your home. With a wall-hung toilet and an in-wall tank, cleaning your bathroom will be a breeze. Engineered with low-noise fittings and decoupled piping, the GROHE Whisper technology reduces noise transmission to adjoining rooms. The GROHE EcoJoy dual flush system will reduce your water consumption by up to 50% – saving water and money. 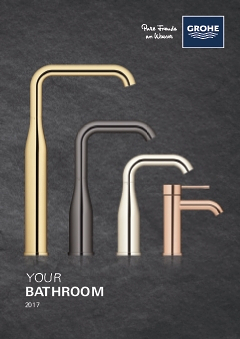 GROHE Sensia shower toilets will revolutionize your daily bathroom routines. Combined with this installation system and the GROHE flush plate of your choice, they will be a perfect match for any bathroom interior. Please note that for mounting the small flush plate the GROHE revision shaft (40911000) has to be purchased separately. For a seamless look also check out GROHE’s wide range of coordinated bathroom collections – including taps, showers, accessories and ceramics! * This installation system is also compatible with shower toilets produced by other manufacturers.